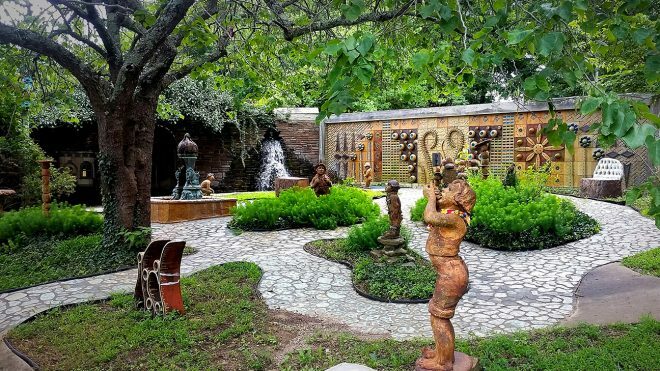 The Fall Music & Art Festival annual fundraiser, held on September 9th from 12 p.m. to 6 p.m., celebrates the local heritage folk arts of Northwest Arkansas through Terra Studios and their dedicated group of employees. All of the proceeds of the event go towards their mission of “using art to create a better world.” This year’s proceeds will help them continue to maintain and upgrade the wonderful park, as well as fund new art projects and upcoming events for the community. Pre-sale tickets are now available for $10. Day-of admission will be $15 at the gate. Supporters who would like to contribute but are unable to attend the festival can still donate directly to their website. Terra Studios started in the mid 1970’s as a personal studio for the Ward family and with the success of the Bluebird of Happiness Terra Studios became a whimsical place of art. It was in 2007 that James Ulick bought Terra Studios and in 2014, Ulick and a few friends founded a nonprofit organization called Using Art to Create a Better World, then giving Terra Studios and the rights to the Bluebird of Happiness to the new nonprofit. They exist to promote the arts, teach art methods, assist artists, and inspire creativity, supporting personal growth and development, problem-solving skills, creative thinking and social skills. With the new ideas, inventions, and solutions, they’ve given their participants the power to shape a brighter future and uphold their mission, Using Art to Create a Better World.